Big thanks to Michael Ritchie for taking the time to speak with me while I was visiting today. If you want to see the full gallery, for now please check out Foam From Above on Facebook. It was quite the visit! I spoke with Michael about a lot of the new developments over the coming year, and not a lot that I can really substantiate (because they have a lot of ongoing discussions.) 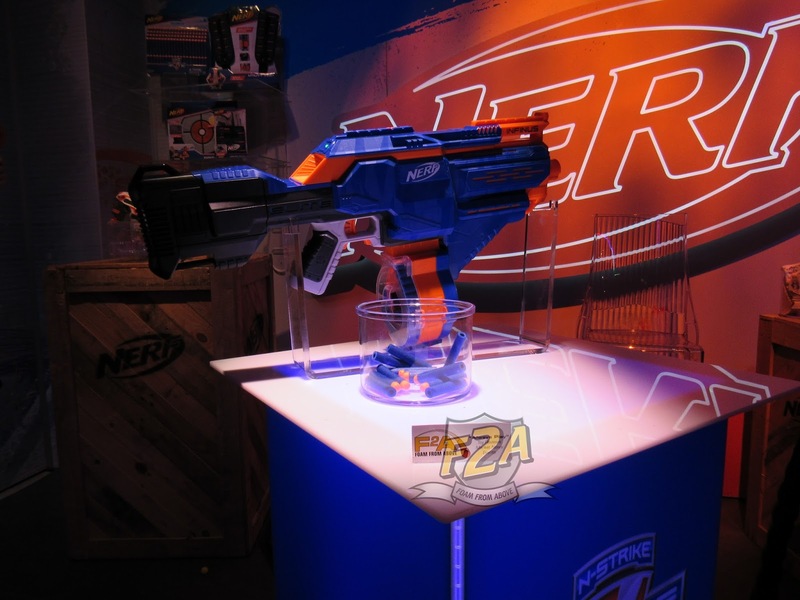 What these discussions I can't say, but one key element is the Kingsman agreement with Nerf to open an arena in Asia. I likened this to the Paragon/UK situation a few years ago, but that was very limited in scope to the UK. The arrangement with Asia isn't. I've been messaged by a comrade in Singapore who has some insight to this, and it's interesting, is all I'll say. Hasbro's Singapore branch better pay attention though, there's a very stout community out there and it would be nice to see that fandom involved somehow in the development of this plan. I did ask the U.S. side of things and... it's ongoing. 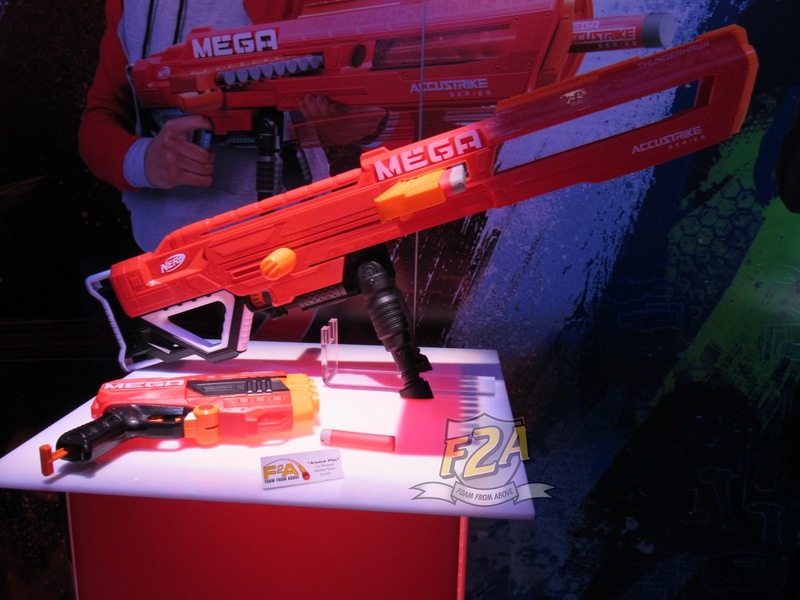 One key thing I think I picked up was that Hasbro is a much larger experience than Nerf. As fans we have to remember that there's a lot going on at there that's more than the community. Transformers, Power Rangers now, and Gaming. 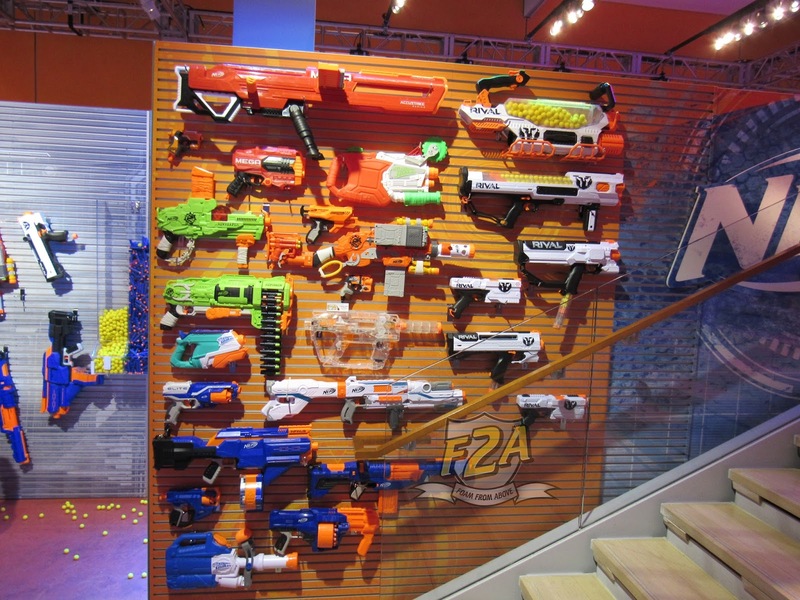 Hasbro Gaming accounted for one of the top branches of performance in Hasbro's Business. What does this mean for us? That while yes, maybe arenas will happen, but they will be so much more. As for existing arenas, well, that's another conversation for another day. 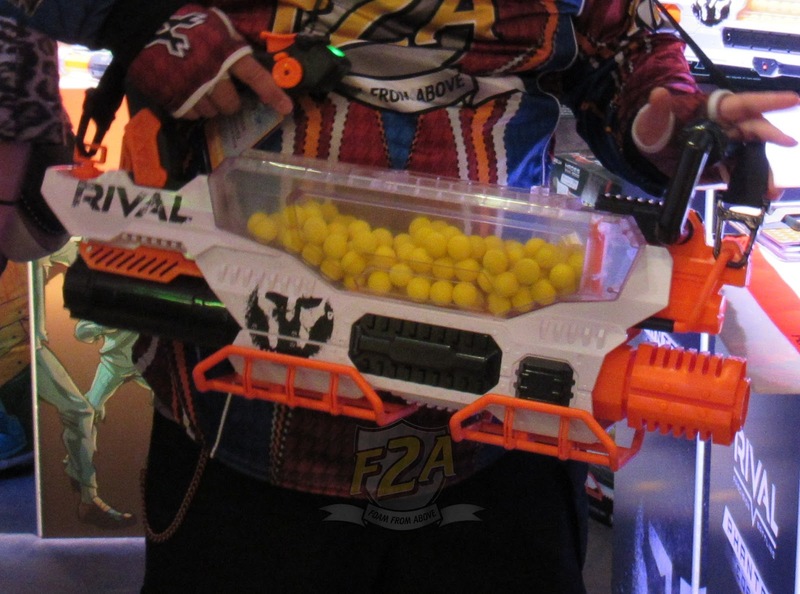 Having spoken to a few arena owners in the past, I brought up the subject of possible industrial-grade supplies and ammo. While the feedback was something unique, who knows if the demand is high enough for them to consider it. 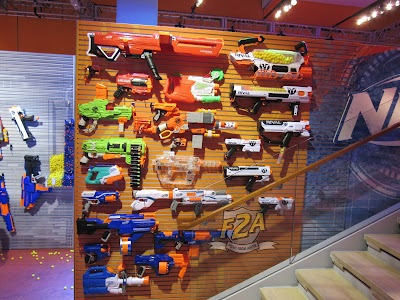 The stresses of blasters in arena-level usage might match the stress testing at HQ? Still, it was an interesting point to bring up. One new bit of info I heard was the preference of the pump-action grip vs a handle, as while I was here I heard apparently the Artemis handle has a habit of cracking. 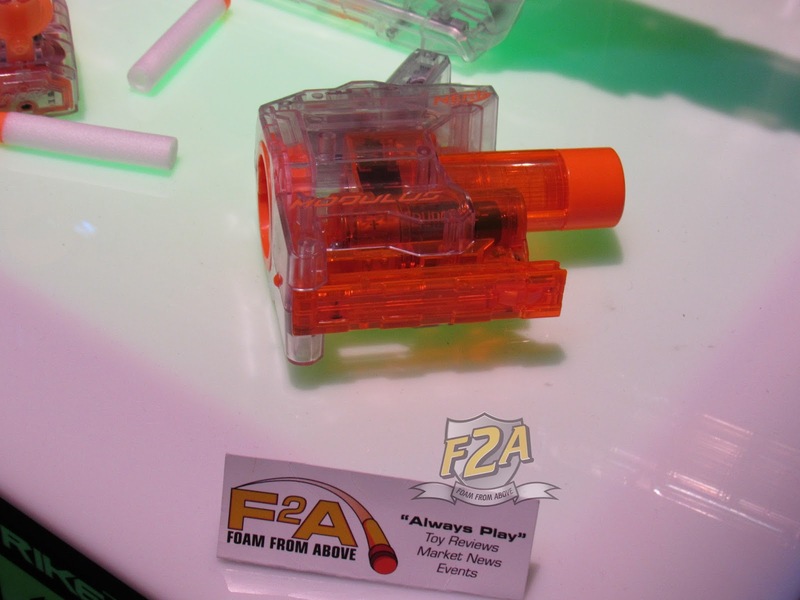 Bringing this up to the Nerf reps, they were intrigued about how it happened. There are a few other subjects we broached, but I'll leave those to the walls of the showroom. This little surprise is the Delta Trooper. 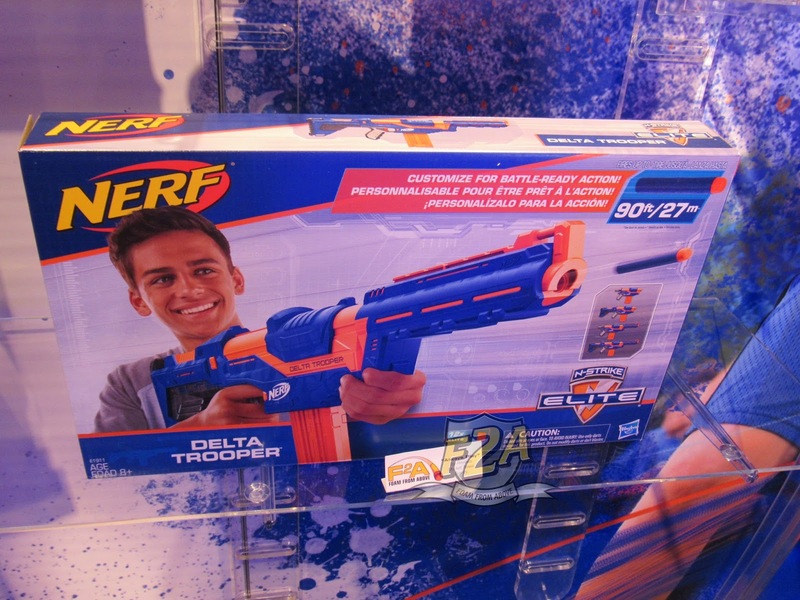 The information wasn't fully given to me in a press kit, so I don't have the price on the Delta Trooper right now (I can't speak for anyone else) but I'll get it as soon as I can. 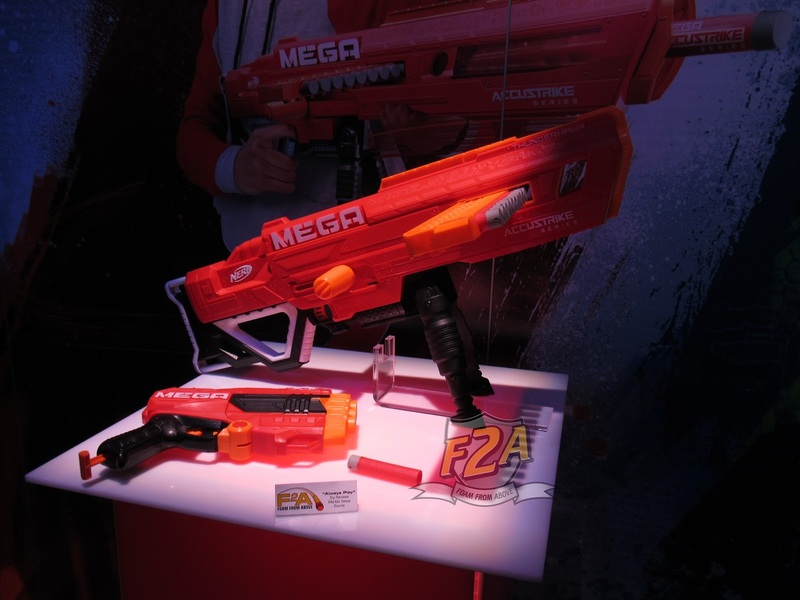 What I can tell you is it is spiritually like a Retaliator (they say the design is a bit modernized, and I can see that with some of the smoother lines on the blaster) and it has slamfire. Even better that this has slamfire and A STOCK. Maybe someone in the comments can remind me, but slamfire on a Recon was a mod at one point, wasn't it? Either way, at first glance and a little bit of usage, it felt pretty cool. I like it. Next up, Nerf Zombie Strike Scravenger. I believe everyone figured this was the Modulus for Zombie Strike, and they were right. You have the attachments and everything to start off the Scravenger main body, and, and then there will be follow up accessory packs. 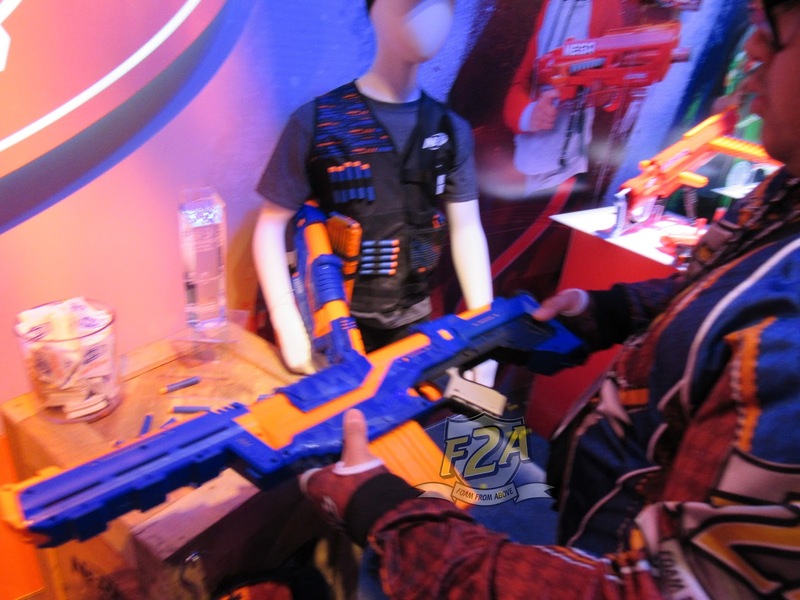 In addition to the first-ever switch for Slamfire/lever blasting action, the accessories included are a smart-AR two shot jolt, barrel extension, magazine holder, scope, and red sight. The Twinslice (buzz saw blades) and Chop Stock (Axe-tension) are going to be future accessory kits to add-on to the Scravenger, sold separately. The fun part about the Twinslice is it's not the bayonet people initially thought; it's a holster for throwable buzz saw blades. Caught me by surprise, for sure. 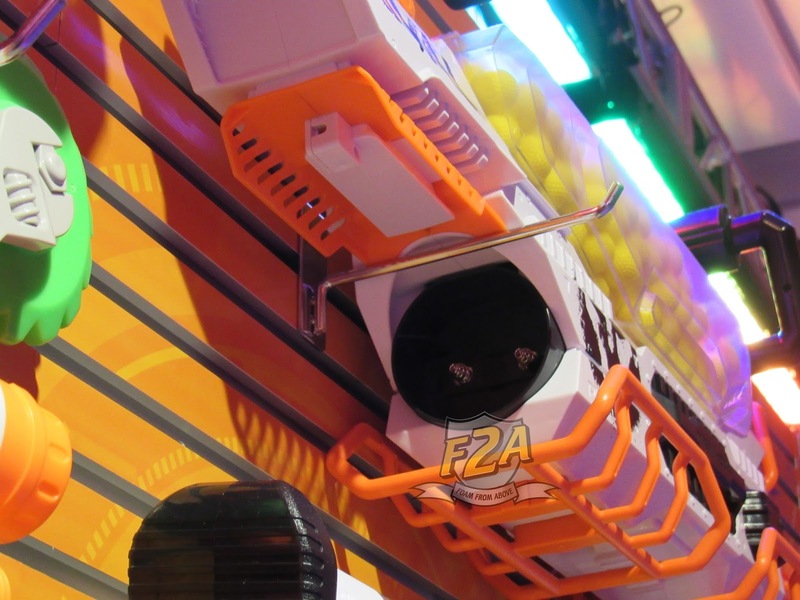 The Chop Stock is adjustable, and has foam edges. The main construction is plastic, but the edges are foam. The Nerf Ghost Ops Evader is basically a stryfe; stock attach point, single trigger pull per shot, but obviously the grip and feel is a little different. 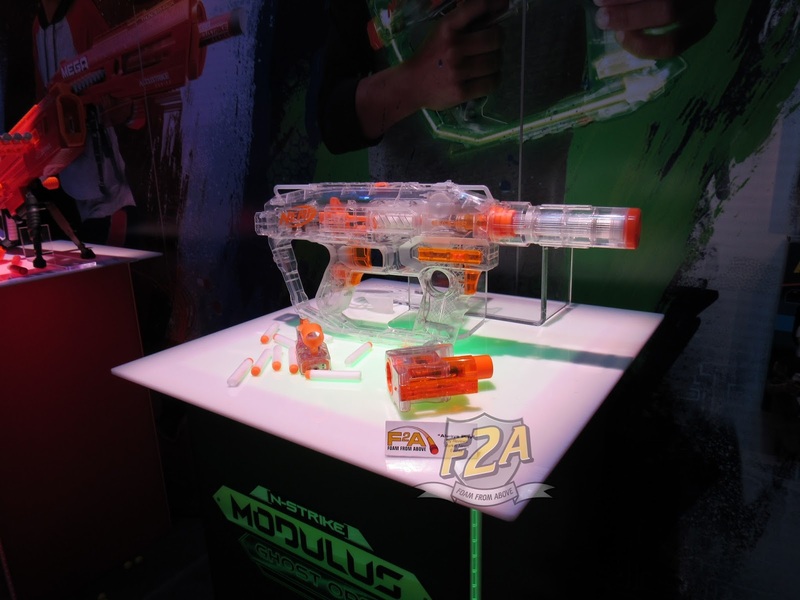 The big features are the light-up aspects of the blaster, but the additional accessory functions as an ammo counter and chronograph. You can start the count at a certain number (say a 35 round drum) and have it count down, or start counting from 0 to count up. The community has been using chronys for testing for years, and Nerf's picked up on the pattern. Additionally, they now have their own ammo counter design out now, but anyone who's been around also knows there's a third party Ammo Counter, who makes a similar (but with significant differences) product. The blaster was a low enough profile that it didn't feel awkward to use, so at this point I think it's pretty neat. Definitely looking forward to seeing it again later this year. 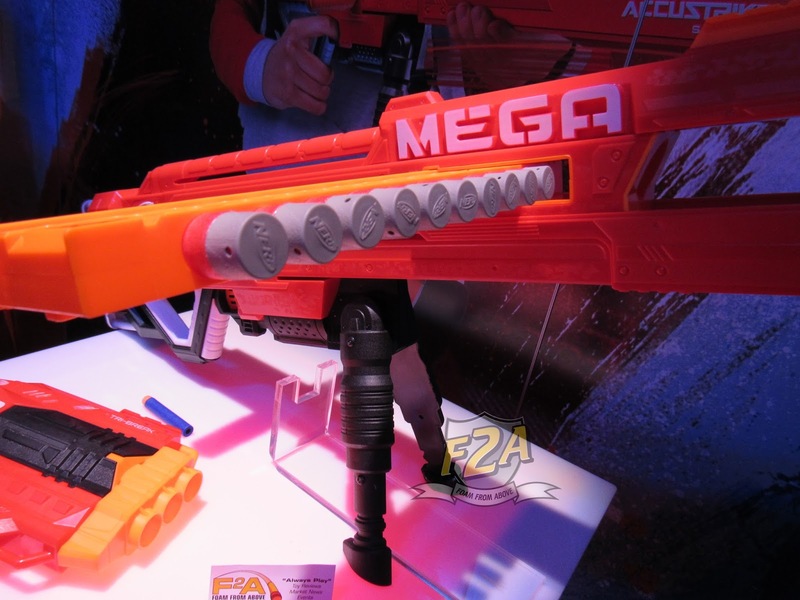 The Nerf Mega Thunderhawk.... imposing, aesthetically very interesting, and it feels like a solid and powerful rifle. I'll have video eventually but I think this was still a very prototype model, as the darts drooped a bit for some shots. Maybe it was the ammo, but I'd give this another look at release. One interesting design note is that the magazine is integrated. It starts on the left, and progresses to the right, then when you empty the mag you push it back to the left, like a typewriter. On the one hand, it spares you buying new magazines, but on the other I don't know how left-handed users will receive this. Additionally, the mag sticks out so far I'd be wary of using it indoors just in case there's a narrow doorway and accidents happen. As established the blaster's barrel extension moves manually, no spring-loaded action when moving the bipod. Even the sliding motion feels robust and powerful, there's no other way to describe it. Whether you use the snub nose configuration or extend the barrel, the blaster has weight and a feel of transforming it that really makes a significant noise and feel. As for the Accustrike Mega darts, there's no groove like regular size accustrike darts, and the head is basically solid just flush with the foam body and holes to make a whistle. Worth another look at release definitely. The Nerf Infinus - what a design. The Quickload technology is new, and pretty freaking awesome. Supposedly works with any mag, and if it jams it knows to shift two times in a row. The door jam is also on the side, so there is a way to get in. You don't have to hold down the accelerator trigger to activate the Quickload either, it's basically "always on." Definitely feels a little heavy in the back, but the blaster is a robust build and feels pretty solid. The blaster is full auto, so you definitely need to reload on the move with something like this. The rate of fire didn't feel as fast as a Hyperfire I think, but given the early state at Toy Fair, I'll give it a pass on that for now. But the new feature worked perfectly, and I am heavily encouraged at seeing that. Definitely something to give a look when it's released as well. It has its own type of rechargeable battery pack, $199.99 MSRP. So, it's big, expensive, heavy, and LOUD. But so neat, to put it lightly. The Nerf Ripchain was different... 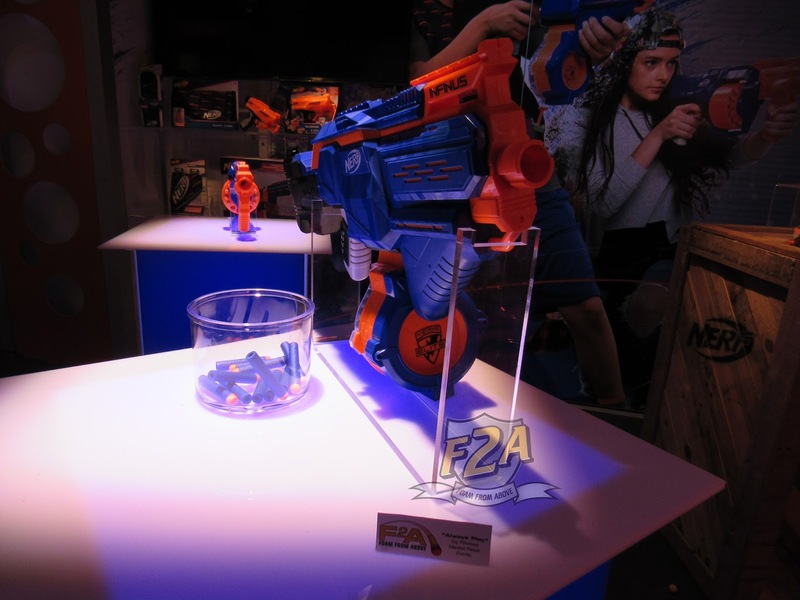 I didn't expect to see Nerf going with chains again on any blaster any time soon but it looks like they did here. It opens up like a Vulcan, and the belts looks similar to Vulcan chains (so I think that stack of chains I have from the past are going to come back like a pair of retro bellbottoms). One note is that the plastic on the Ripchain chains feels a bit stronger than the old Vulcan chains, interpret that as you will. 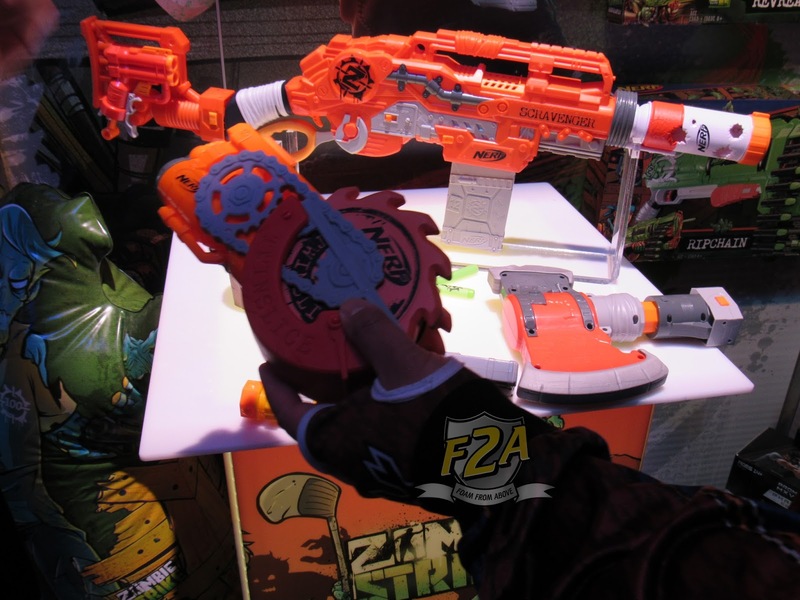 As for the blaster itself, it has slamfire, is pump-action, and decorated as Zombie Strike is. 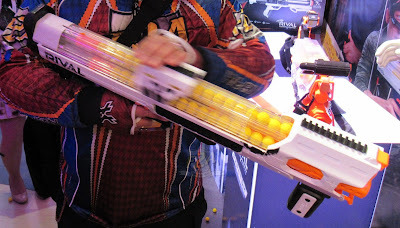 It felt comfortable enough to shoot, the chains obviously swing around so it's not a blaster you can be sneaky with or run without sounding an alarm. But what's old (chains) is new again here. 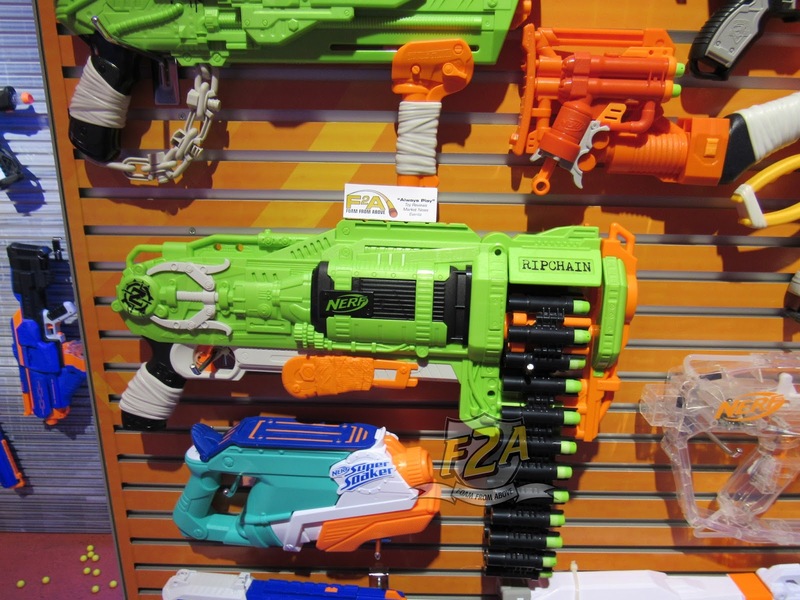 Much like the zombies in the Zombie Strike universe chains are rising up in Nerf blasters with the Ripchain. There were also new goggles for Rival, Series 2 of microshots (all still one barrel, Roughcut microshot is still one dart), some new licensed bags and things, and then some new store exclusives, including a Phasma Rival blaster like the Deadpool and Boba Fett sets that were out last year. Deadpool is also going to get an Apollo colored version, so plenty more in store exclusives (Best Buy, Gamestop, and so on) with the Nerf line as well.